Shui Qing Ye, M.D., Ph.D.
School of Medicine Dean Steven Kanter, M.D., has announced the appointment of Shui Qing Ye, M.D., Ph.D. as chair of the Department of Biomedical and Health Informatics. The appointment will take effect January 1, 2018. A professor of pediatrics at the School of Medicine, Ye will continue to occupy the William R. Brown / Missouri Endowed Chair in Medical Genetics and Molecular Medicine. As department chair, he will work closely with faculty, staff, and students to help position the Department of Biomedical and Health Informatics as a catalyst of innovation and creativity. Ye is an expert in genomics and translational bioinformatics, which will help foster important collaborations with other units throughout the university and with School of Medicine clinical partners. He has a strong track record of using new-age tools to gather and explore Big Data, and of partnering with researchers locally and worldwide in an effort to pinpoint new diagnostic biomarkers and therapeutic targets for human diseases. Ye is the author of two highly acclaimed books on bioinformatics and Big Data in addition to extensive research experience. He served previously as director of the Gene Expression Profiling Core at the Center of Translational Respiratory Medicine at Johns Hopkins University School of Medicine. Additionally, he served at the University of Chicago Pritzker School of Medicine as director of the Molecular Resource Core. Ye earned his medical degree from Wuhan University School of Medicine at Wuhan City, Hubei Province, China. He completed a postdoctoral fellowship in lipid metabolism at the Oklahoma Medical Research Foundation in Oklahoma City, and received his Ph.D. in molecular mechanisms of disease from the University of Chicago Pritzker School of Medicine. School of Medicine Dean Betty M. Drees, M.D., F.A.C.P., delivered the annual Marjorie S. Sirridge, M.D., Outstanding Women in Medicine Lecture on Sept. 18. 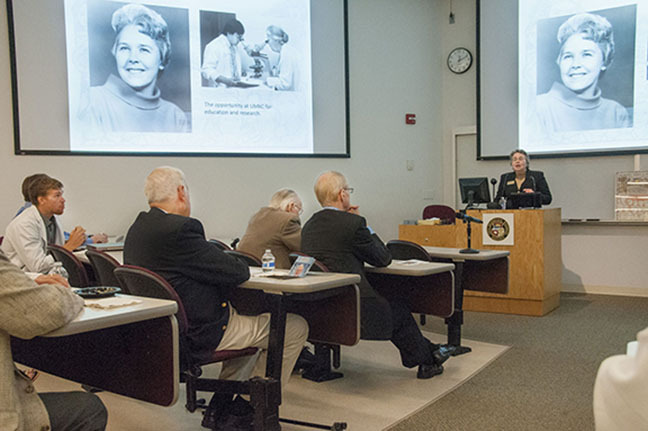 From the beginning more than 40 years ago, women have played major role in the history of the UMKC School of Medicine, said the School’s Dean, Betty Drees, M.D., on Sept. 18 as the speaker at the annual Marjorie S. Sirridge, M.D., Outstanding Women in Medicine Lecture. Drees joined the School of Medicine as Associate Dean for Academic Affairs and was appointed interim dean of the medical school in 2001. She was named the permanent dean in 2003 and will step down from that role on Oct. 1. “I owe the opportunity I had here to Marjorie Sirridge,” Drees said. Drees said she drew the inspiration for her lecture from Sirridge’s passion for story telling and for championing women in medicine. Throughout her talk, Drees recognized many of the women who have made a notable impact on the School since its inception in 1971, such as Virginia Calkins, who served as the School’s first assistant dean for students and who played a large part in increasing the number of women students who enter the School to nearly 50 percent by 1979. Today, just less than half of the School’s 3,241 alumni are women. “I believe women were very important in moving us from where were to where we are now,” Drees said. She also shared how the number of women among the School’s faculty has grown to 47 percent of the current faculty and how many have taken on leadership roles including five current academic department chairs as well as women leading a number of School’s academic programs. “We have women who are continuing to bring on new programs and be leaders in those programs,” Drees said.